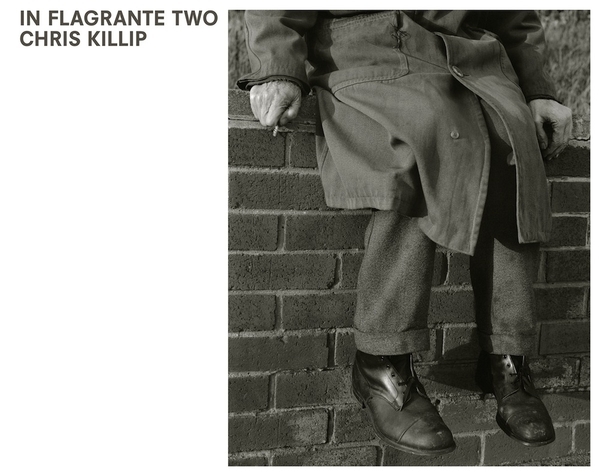 Book Review In Flagrante Two By Chris Killip Reviewed by Colin Pantall In Flagrante by Chris Killip was published in 1988 and is a classic example of empathic British documentary photography. Made in the northeast of England between 1973 and 1985, the book showed marginalized communities on the edge of change; seacoal gatherers, fishermen and other working class communities are shown struggling in environments that are expressively harsh. In Flagrante Two. By Chris Killip. Steidl, Gottingen, Germany, 2016. In English. 108 pp., 50 black & white illustrations, 14¼x11¼". In Flagrante by Chris Killip was published in 1988 and is a classic example of empathic British documentary photography. Made in the northeast of England between 1973 and 1985, the book showed marginalized communities on the edge of change; seacoal gatherers, fishermen and other working class communities are shown struggling in environments that are expressively harsh. There is the wildness of the Northumberland coastline, driving blizzards brought from Siberia across the ferocious waves of the North Sea, the chimneys and cranes of the region’s industrial landmarks, and the rubble of neighborhoods destroyed in the name of urban development. It’s an unrelentingly gritty backdrop. Living against this backdrop were the communities Killip lived and photographed amongst. Like Sirkka-Liisa Kontinen before him (another great chronicler of the northeast of England), Killip was involved with the Amber Collective and the associated Side Gallery, organizations that put involvement with the community at the forefront of its collective practice. These were not cold and distant pictures, but came from the heart of the communities. Their interests were his interests. In Flagrante Two. By Chris Killip. Steidl, 2016. In Flagrante was published in 1988 and remains one of the great English photobooks. Its cover featured two kids sitting on a cart against a sack of seacoal, the North Sea breaking onto the black slag beach in the background. The pictures ran across the gutters, very obtrusively in many cases, with high contrast grainy blacks giving it a photojournalistic 1970s feel. It was a little bit rough around the edges, but that matched the content. You knew exactly where the work was coming from. It was an imperfectly formed masterpiece. For a long time, In Flagrante was completely unavailable. If you didn’t have a copy and couldn’t afford the exorbitant used prices, you’d have to beg or borrow one from somebody who did. Then Errata Editions came along with their Books on Books to make an edition on In Flagrante. With a complete reproduction of the original within its pages, this is still the best way to view the book in the spirit in which it was originally made. But contexts change and so do histories, and now, after years of saying he wouldn’t do it, Chris Killip has allowed a second edition to be made, an updated edition titled In Flagrante Two. In doing so, he has addressed some of the key problems he identified in the first edition; the images don’t run across the gutter, but are presented as single images on each double page spread. The heavy blacks and dicey grain have gone resulting in much more even reproduction. And the final problem (which Killip says was an over-identification with the Thatcher era) has been addressed by replacing the original text with a simple statement that says, ‘The photographs date from 1973 to 1985 when the prime Ministers were: Edward Heath, Conservatives (1970-1974), Harold Wilson, Labour (1974-1976), James Callaghan, Labour (1976-1979), Margaret Thatcher, Conservatives (1979-1990).’ Given the iconic content of the book, this strategy might not work as well as Killip had hoped. It is a book that will still be identified with the Thatcher era, its timescale notwithstanding. The book itself is superb as you expect, but there are a few differences. First of all, the cover is different. It features the man on the wall with the boots and the overcoat. It’s an image of a past time and it’s far more gentle in tone than the original cover. It creates a distance, a distance added to by the printing. It’s far more consistent and lighter than the original. The charcoal tones are turned down to middle greys and we end up with pictures that are pleasant to look at, that would (and do) look great on a wall. Open the book and the sequencing is pretty much the same as the original. It starts with an image of a man painting a picture of a cliff face, the seas and cloud cranked up to dramatic levels, with seagulls adding to the coastal drama. There’s a bonfire, and a streetscape; terraced housing in the snow, a wall with ‘Don’t Vote; Prepare for Revolution’ scrawled across it. There’s the shipyard, the skinhead, the girl with the hoop on the beach. We get the wedding of Charles and Diana, boys sniffing glue and the seacoal camp at Lynemouth. There’s lovers on the beach, dancing skinheads at an Angelic Upstarts gig, the block of flats with ‘Bobby Sands, Greedy Irish Pig’ written across it (photographed on the day that Margaret Thatcher announced the IRA hunger striker’s death), the miner wearing a policeman’s helmet and a pig mask, and horses, dogs and crabs in equal measure. There are a few additions; a playground set against an industrial backdrop of cooling towers, chimneys and piles of slag, and, most tellingly, just before the end of the book, the row of terraces with ‘Don’t Vote…’ written across them all knocked down and demolished, a pile of rubble that is all that is left of what were once family homes. And then the book ends with the picture of the son sitting on his father’s shoulders. Both are of another age, and both seem slightly puzzled at what the world has become. Both probably deserved better, but given what has happened in Britain in the last few years, they almost certainly didn’t get it.